SAN DIEGO – October 30, 2018 – NuVasive, Inc. (NASDAQ: NUVA), the leader in spine technology innovation, focused on transforming spine surgery with minimally disruptive, procedurally-integrated solutions, today announced financial results for the quarter ended September 30, 2018. Company updates full-year 2018 guidance. The Company’s financial results reflect continued improvement of its in-sourcing efforts at the West Carrollton, Ohio manufacturing facility, and the Company reiterated expectations that the facility will drive an additional 130 to 150 basis points in operating margins in 2019. NuVasive also recently made several key technology introductions and partnership announcements, including the unveiling of the NuVasive PulseTM surgical automation platform, Spine Precision Partnership with Siemens Healthineers and signing of a strategic partnership with Biedermann Technologies to further enhance NuVasive’s best-in-class complex spine deformity technologies. The Company also launched several new products to further reinvigorate its Biologics business line, which continues to recover at a faster-than-expected pace. The Company now anticipates its Biologic business will return to growth in the fourth quarter 2018. NuVasive reported third quarter 2018 total revenue of $271.3 million, a 9.8% increase compared to $247.1 million for the third quarter 2017. On a constant currency basis, third quarter 2018 total revenue increased 10.2% compared to the same period last year. 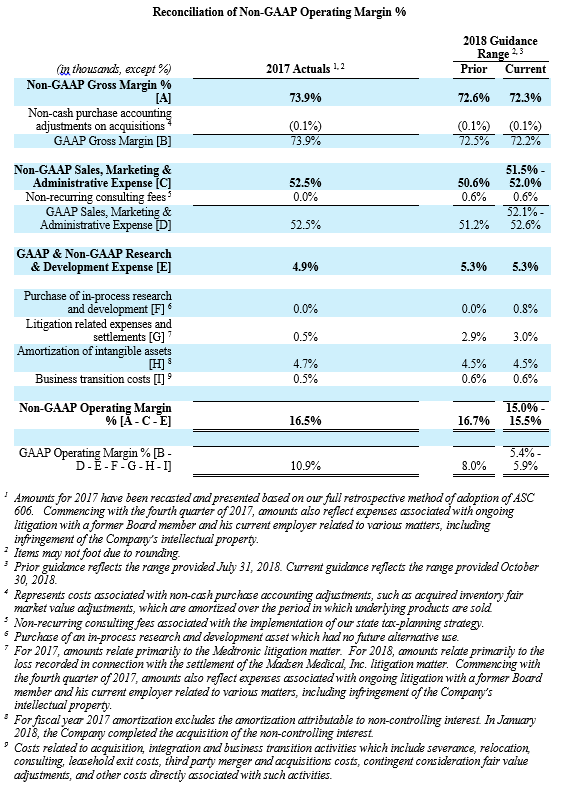 For the third quarter 2018, GAAP and non-GAAP gross profit was $197.1 million and $197.4 million, respectively, while GAAP and non-GAAP gross margin was 72.7% and 72.8%, respectively. 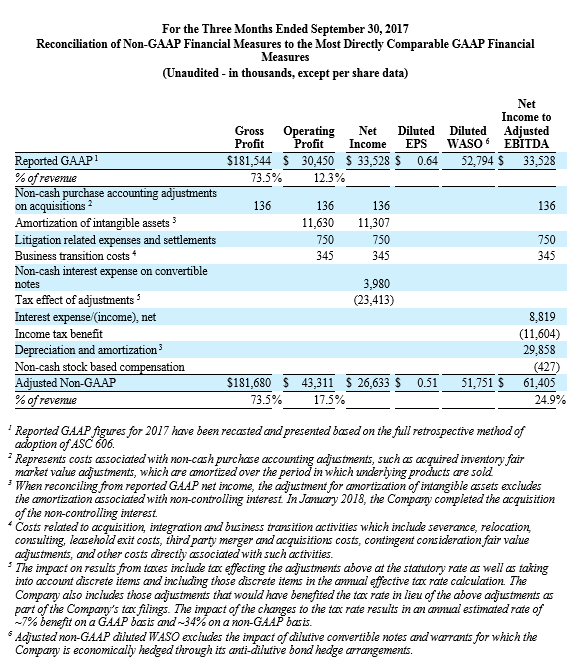 These results compared to GAAP and non-GAAP gross profit of $181.5 million and $181.7 million, respectively, and both GAAP and non-GAAP gross margin of 73.5% for the third quarter 2017. 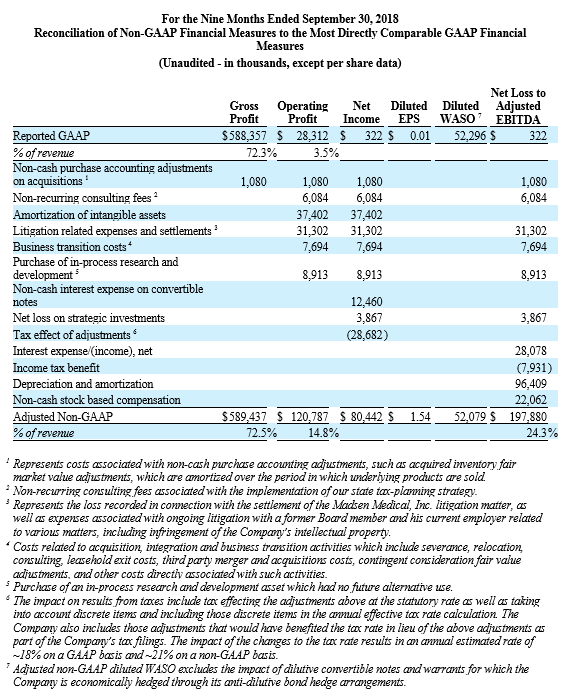 Total GAAP and non-GAAP operating expenses were $179.2 million and $155.1 million, respectively, for the third quarter of 2018. 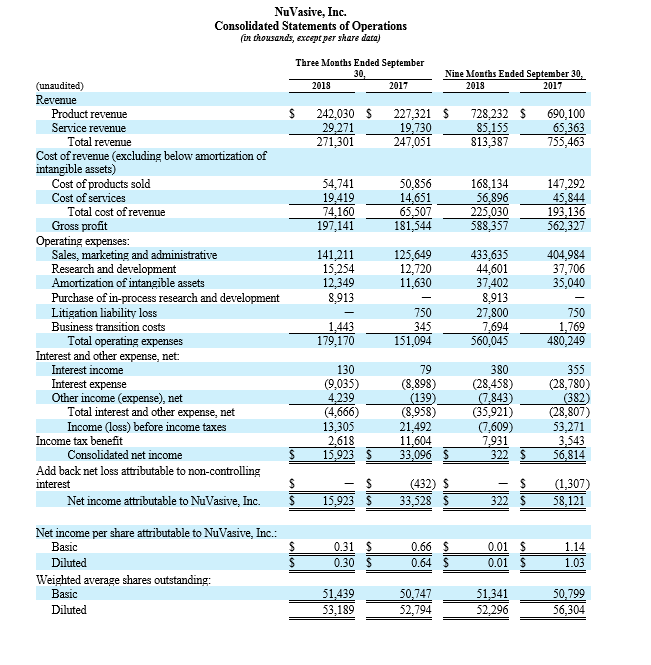 These results compared to GAAP and non-GAAP operating expenses of $151.1 million and $138.4 million, respectively, for the third quarter 2017. 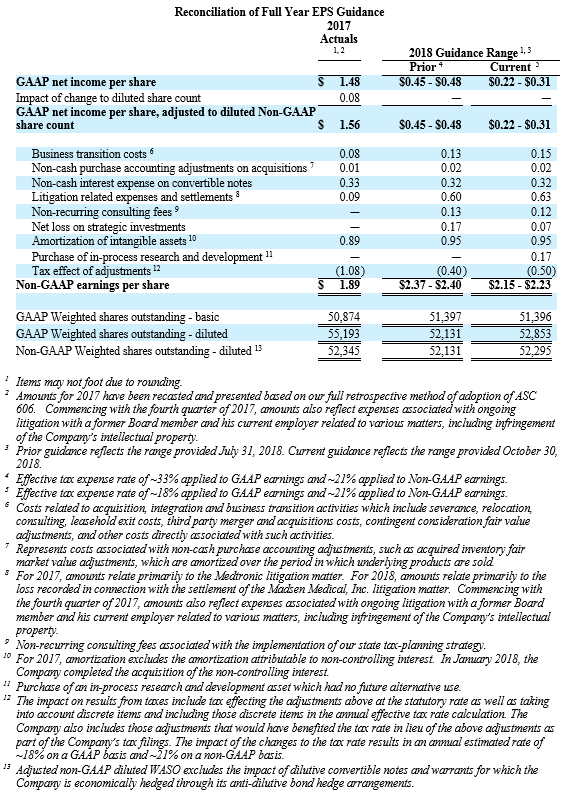 NuVasive reported GAAP net income of $15.9 million, or $0.30 per diluted share, for the third quarter 2018 compared to GAAP net income of $33.5 million, or $0.64 per diluted share, for the third quarter 2017. On a non-GAAP basis, NuVasive reported net income of $29.5 million, or $0.56 per diluted share, for the third quarter 2018 compared to net income of $26.6 million, or $0.51 per diluted share, for the third quarter 2017. 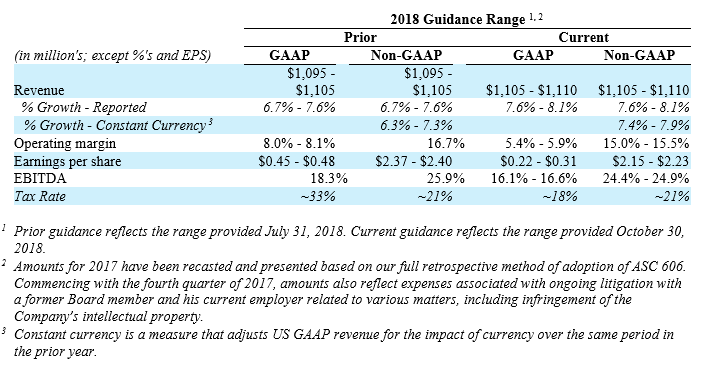 The Company updated its full-year 2018 financial guidance by increasing its revenue guidance by $5 million to reflect a new range of $1,100 million to $1,110 million and reducing its non-GAAP operating margin guidance range to 15.0% – 15.5% as a result of accelerated investments in infrastructure and commercial sales force in anticipation of the overall spine market growth trending up to more historical averages. The Company expects to drive an adjusted EBITDA of approximately $269 million to $276 million, compared with the prior expectation of approximately $283 million to $293 million. The above guidance assumes a full-year benefit of U.S. tax reform, suspension of the medical device tax and the SafePassage acquisition. For additional financial detail, please visit the Investor Relations section of the Company’s website at www.nuvasive.com to access Supplementary Financial Information. 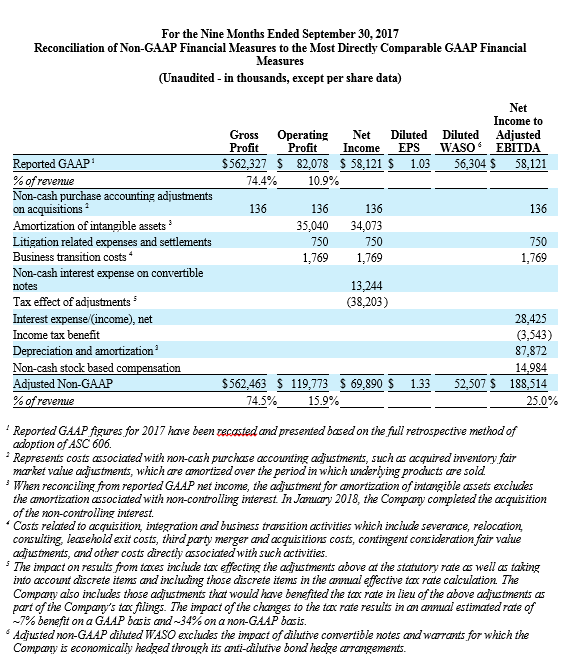 Management uses certain non-GAAP financial measures such as non-GAAP earnings per share, non-GAAP net income, non-GAAP operating expenses and non-GAAP operating profit margin, which exclude amortization of intangible assets, business transition costs, purchased in-process research and development, one-time restructuring and related items in connection with acquisitions, investments and divestitures, non-recurring consulting fees, certain litigation expenses and settlements, gains and losses from strategic investments, and non-cash interest expense (excluding debt issuance cost). Management also uses certain non-GAAP measures which are intended to exclude the impact of foreign exchange currency fluctuations. The measure constant currency utilizes an exchange rate that eliminates fluctuations when calculating financial performance numbers. 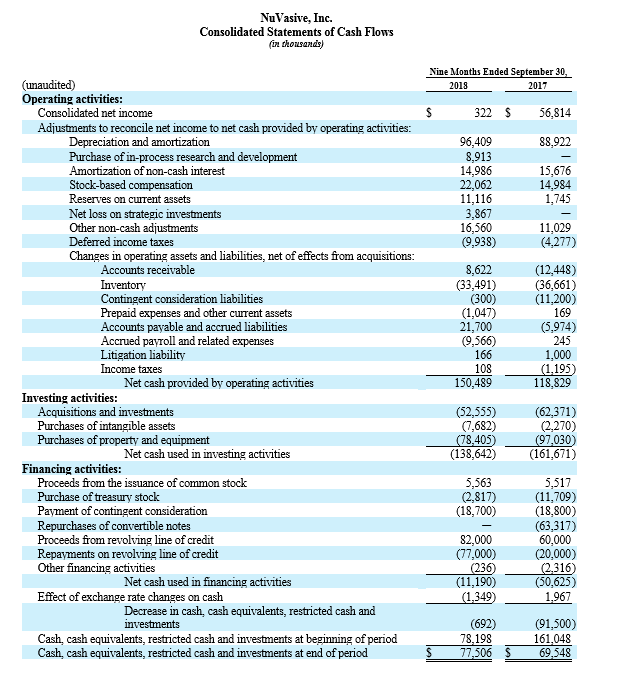 The Company also uses measures such as free cash flow, which represents cash flow from operations less cash used in the acquisition and disposition of capital. 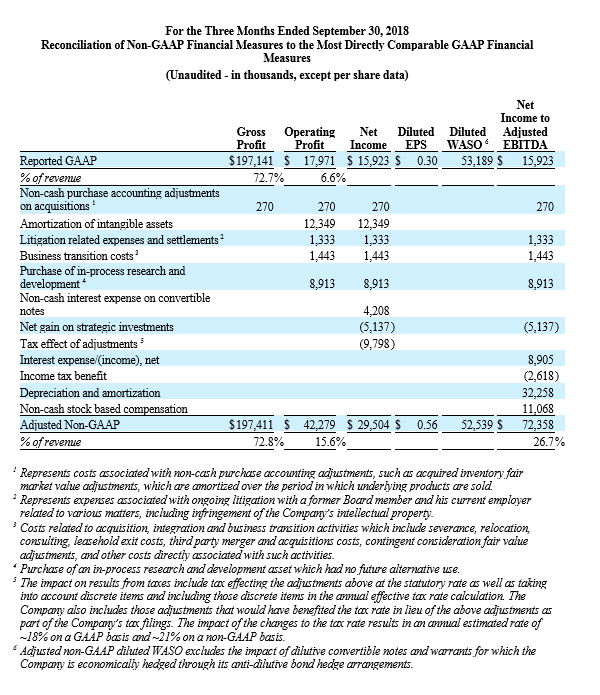 Additionally, the Company uses an adjusted EBITDA measure which represents earnings before interest, taxes, depreciation and amortization and excludes the impact of stock-based compensation, business transition costs, purchased in-process research and development, one-time restructuring and related items in connection with acquisitions, investments and divestitures, non-recurring consulting fees, certain litigation expenses and settlements, gains and losses on strategic investments, and other significant one-time items. During the quarter ended June 30, 2018, the Company began excluding from its non-GAAP financial results certain litigation related expenses associated with ongoing litigation with a former Board member and his current employer related to various matters, including infringement of the Company’s intellectual property. For consistency and comparability, the Company has re-casted non-GAAP financial results for each of the quarters ended December 31, 2017 and March 31, 2018 to exclude these litigation expenses in such periods, which were $0.4 million and $0.6 million, respectively. NuVasive will hold a conference call today at 4:30 p.m. ET / 1:30 p.m. PT to discuss the results of its financial performance for the third quarter 2018. The dial-in numbers are 1-877-407-9039 for domestic callers and 1-201-689-8470 for international callers. A live webcast of the conference call will be available online from the Investor Relations page of the Company’s website at www.nuvasive.com. After the live webcast, the call will remain available on NuVasive’s website through November 27, 2018. In addition, a telephone replay of the call will be available until November 6, 2018. The replay dial-in numbers are 1-844-512-2921 for domestic callers and 1-412-317-6671 for international callers. Please use pin number: 13683334. NuVasive cautions you that statements included in this news release or made on the investor conference call referenced herein that are not a description of historical facts are forward-looking statements that involve risks, uncertainties, assumptions and other factors which, if they do not materialize or prove correct, could cause NuVasive’s results to differ materially from historical results or those expressed or implied by such forward looking statements. In addition, this news release contains selected financial results from the third quarter 2018, as well as projections for 2018 financial guidance and longer-term financial performance goals. The Company’s results for the third quarter 2018 are prior to the completion of review and audit procedures by the Company’s external auditors and are subject to adjustment. 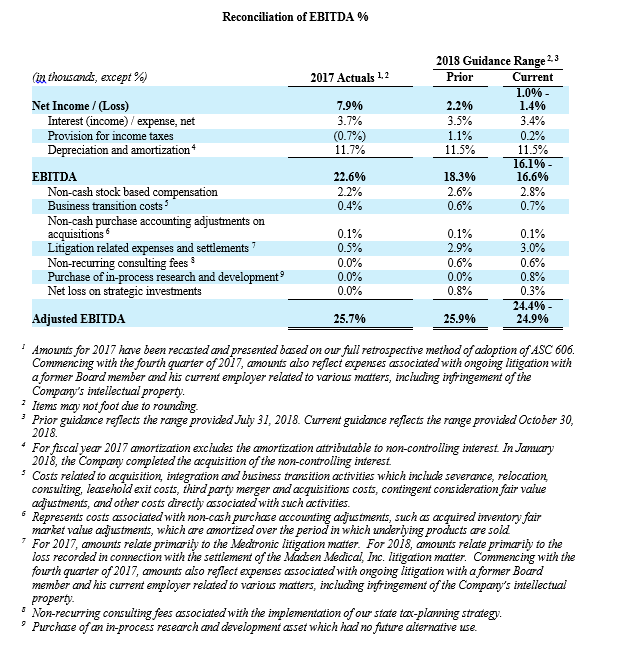 In addition, the Company’s projections for 2018 financial guidance and longer-term financial performance goals represent initial estimates, and are subject to the risk of being inaccurate because of the preliminary nature of the forecasts, the risk of further adjustment, or unanticipated difficulty in selling products or generating expected profitability. The potential risks and uncertainties which contribute to the uncertain nature of these statements include, among others, risks associated with acceptance of the Company’s surgical products and procedures by spine surgeons, development and acceptance of new products or product enhancements, clinical and statistical verification of the benefits achieved via the use of NuVasive’s products (including the iGA™ platform), the Company’s ability to effectually manage inventory as it continues to release new products, its ability to recruit and retain management and key personnel, and the other risks and uncertainties more fully described in the Company’s news releases and periodic filings with the Securities and Exchange Commission. 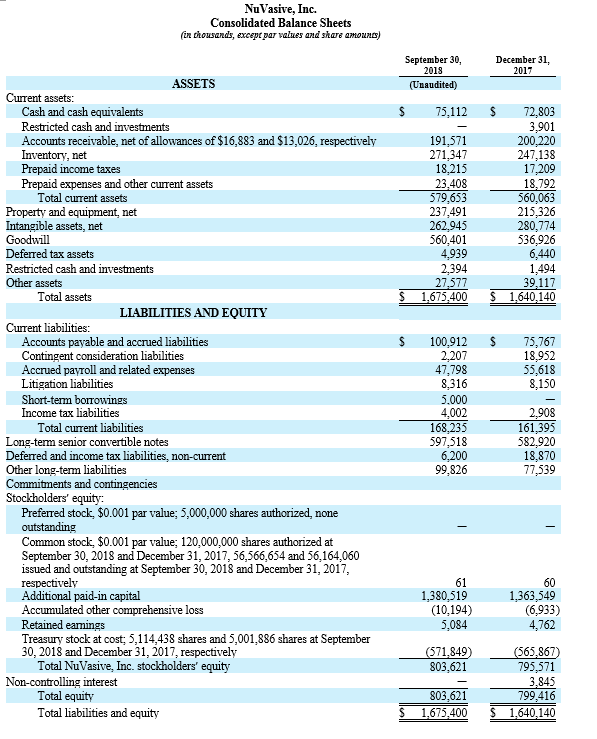 NuVasive’s public filings with the Securities and Exchange Commission are available at www.sec.gov. NuVasive assumes no obligation to update any forward-looking statement to reflect events or circumstances arising after the date on which it was made.